We were very pleased to have a visit by a former pupil of the early 1970s come to see us a year or so ago. Neil Fisher spent quite some time browsing through old school photos, recognising a good number of former classmates and pinning names to faces, many of which we weren't aware of. We're always grateful when former pupils or older Sutton residents can put names to the many faces we have archived here. Both Merrill and Liz were on hand to consult the card index and find the right albums, and Neil and his wife were delighted to rediscover so many faces and memories of former years. Neil is here, in this first photo, top left, standing at the back looking rather thoughtful, and tells us that he remembers these photographic portraiture sessions well, as all the class were involved and many shots involved several 'takes'. And early introduction to the dark arts of photography. 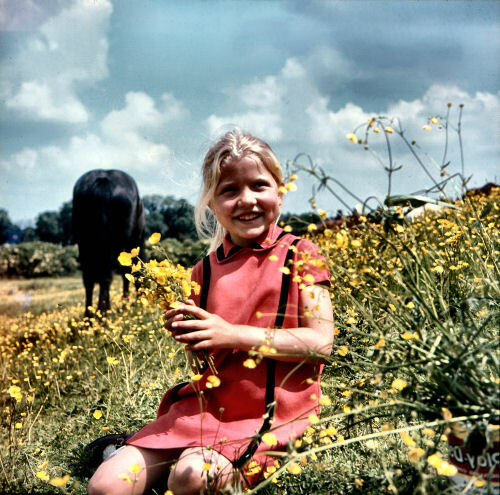 Mr Johnson used to develop his own photos, and so these sessions were indeed multi-lessons in themselves, encompassing several mainstream subjects. First, but not least of course, is art, with smidgeons of history and science thrown in. The science coming via the understanding of the chemicals involved in the developing process, as well as	physics in undertanding optics and how the camera lens works in much the same way as our eyes. A pretty fair grasp of English reading skills would be required if a pupil wished to delve any further to improve his skills and consult the many textbooks on the subject at that time. And finally, I daresay (not being a photographer myself) that a good understanding of basic maths would also be required, if only to understand apperture settings, the principles of light exposure and the zoom lens, let alone the sizing and cutting of the final product. A good all rounder, was photography. where you can see many more. 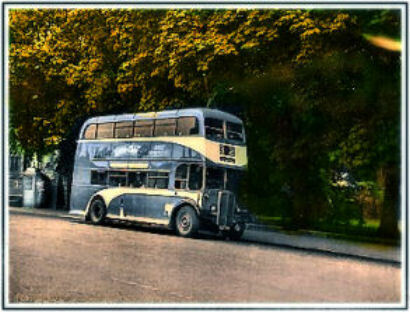 The photo on the right is an AEC Regent III, at the 32 terminus in Sutton. 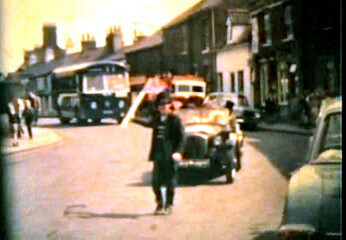 Note the old Hull Telephones phone box by the church wall, only just visible behind the bus, next to the seat. I'm told that the young lads in the village in the 1950s called that seat 'The Parliament', on account of it being a regular meeting places for the then 'senior citizens' of the village, usually the men, who gathered there to discuss the issues of the day and put the world to rights. Now I'm an old man, and I like to gather in like company with other 'old men' and chew the fat and put the world to rights. Nothing changes much, does it. I know these are poor, but they're all we have, taken from poor cine of the early 1960s. Perhaps you were there . . . 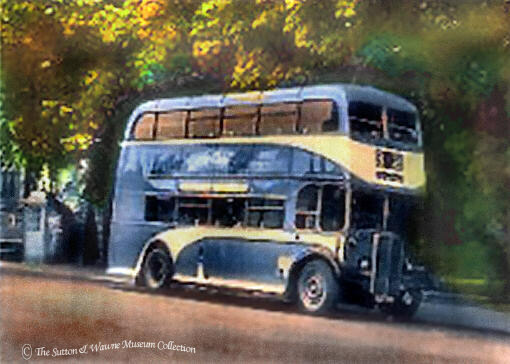 I would be keen to hear from anyone, ex-staff or relatives of staff, that may have old photos of the 'old days' on the buses. That would include both KHCT and EYMS, as many staff worked for both at various times; drivers, conductors and inspectors, fitters, depot and office staff, anyone at all who 'was on the buses' before 1995 and the demise of KHCT. Staff outings, photos in depots or bus stations, particularly of the staff themselves but also the vehicles, all would be very welcome, and all contributors would get a credit when shown. You can email me directly on the email link in the menu. If photos are creased or unclear, I can tidy them up - for voluntary donation to our museum - and send them back to you by email. All photo restoration and repair work is now wholly for the benefit of this museum, and its long term future. The Sutton Branch of the Royal British Legion have lodged with us a small collection of their photos for safe-keeping. These came from their meeting 'hut', which they sadly had to vacate a couple of years ago. Our archivists are now arranging for these to be displayed, with names where known, in a suitable photo album that will sit alongside all the rest of our superb collection of Sutton taken over the decades. We'd be grateful if anyone can identify the 'spaces' in the list of names, where a simple 'nk' stands for 'not known' ... but we would like to know and put the man's name in if we can. I'll post some different photos here over the next few months for folks to try and identify those unknown men. 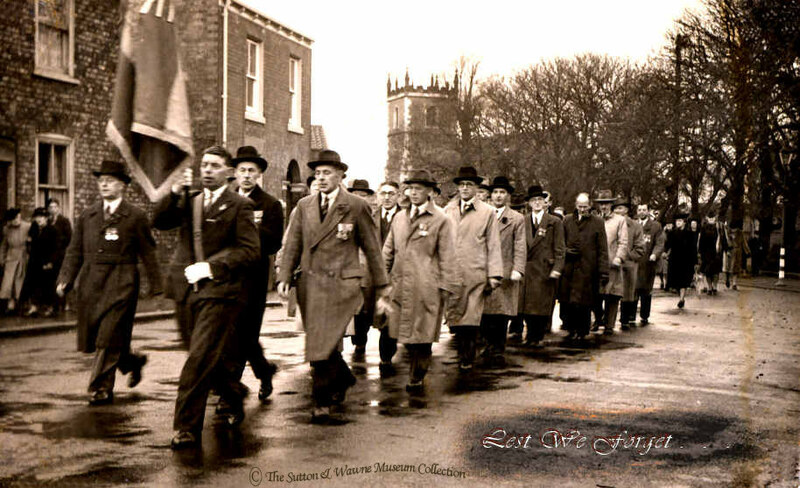 Remembrance Sunday Church Parade on a wet day sometime in the 1950's. These are mostly veterans of the Great War, or the Kaiser's War as it used to be known. What sights, what horrific endurances, did these men see and go through, in their varied and wide-flung units, regiments and ships. We know that the proud men seen marching here are now long gone, and any veterans we see of the same age today are veterans of Hitler's War, men who are sometimes the very sons of the men in this photo, and there's none of them left now. They say that time is a great healer - perhaps so, but for many of these men, the memories never left them, and they were never healed. Even so, scarred as they were, they came home, found work, raised families and kept a roof over their heads, all without a fuss, so much so that many went to their graves without ever telling those families the details of what they had done, or what they had endured. We think we know - but we don't know the half of it. In these four years of the Centenary of that horrific conflict, we remember each and every one of them, and all their friends and pals who were not to be so fortunate to march as they do here, and give thanks for what they all did - every last man of them. have met for the last time, and so have effectively dissolved their branch. had their final get-together on Friday, 28 February, 2014, at The Reading Rooms. course through the aeons of history. all those decades ago, wish them well, and our thanks and gratitude for all they did. Each of these 4 images open in a large, new window - you can close when done using Alt+F4 if you wish, in order to open another one. A rather speckly if atmospheric view from the top of St James' tower, taken in late 1940, looking roughly east towards Salthouse Lane. 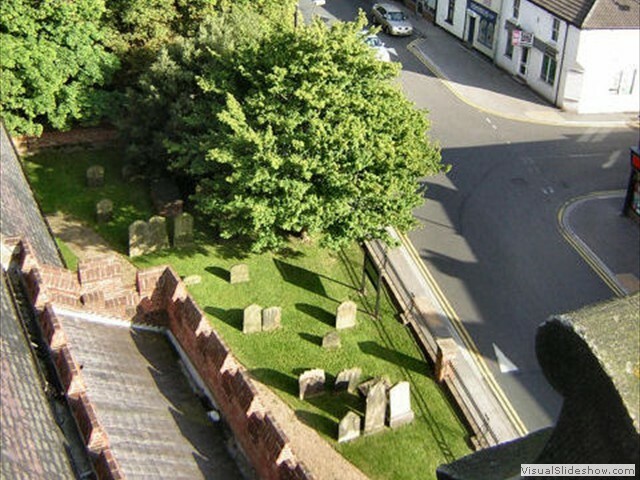 The facades and chimneys of Church St can be seen curving away round to the right. 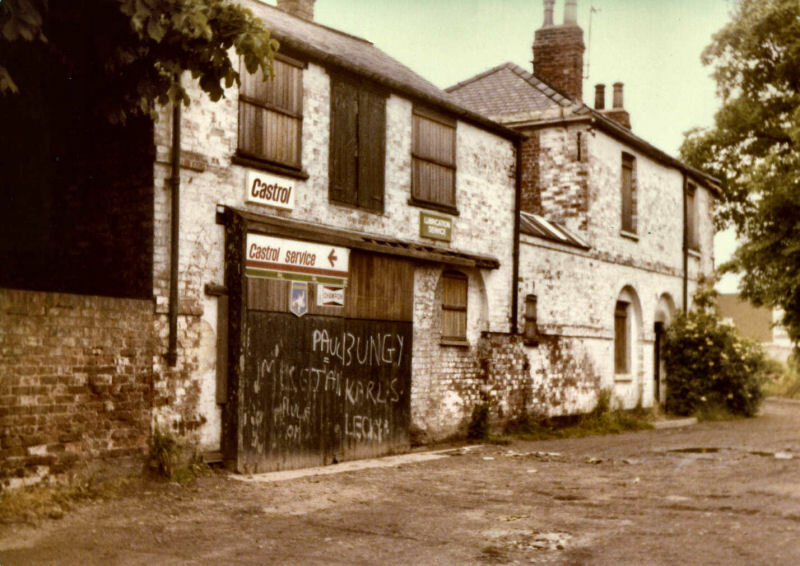 Note the newsagents with the corner door, now long bricked up, and the old post office and cycle shop that later became the famous and much-loved Brown's Fish & Chip Shop. Further along is the half-timbered Duke of Cumberland. An impressive line-up of the St James' bellringing team, of 11 ringers, taken in 1890. Even more of interest when we realise that within this picture are Mr Topham, the school headmaster - 5th from the left with a large white hankerchief in his top pocket; and next to him, the Rev Coleman. 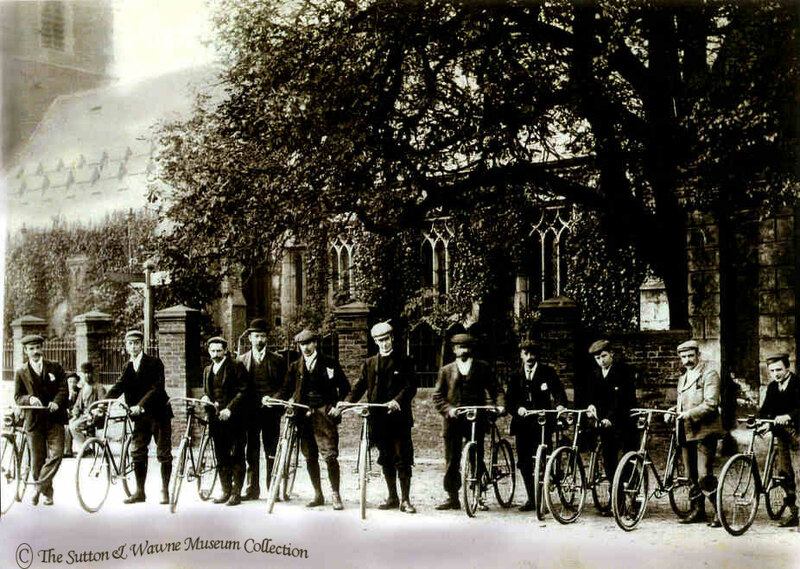 Cycles were something of a luxury then, and for ten of this group to have one each illustrates how popular cycling had become, making a bike a 'must have' of the late Victorian era. 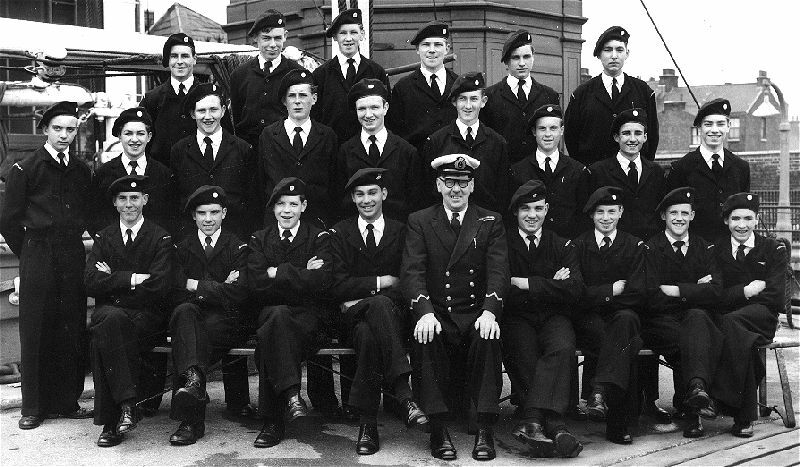 Note the two men sitting on the seat behind the line-up, in front of the church wall. Is that the same seat that has always been there? Legend has it that it's reputed to have stood on that same spot since Queen Boudica was a lass. Looking in the same direction, two decades earlier, in 1914. The grocery van, of 'Field's of Hull' is a Model-T Ford, and the driver or his attendant appear to be having few words with what appears to be a soldier. He wears a flat-topped peaked cap, rather than a helmet, so I'm fairly sure he's not the village bobby. 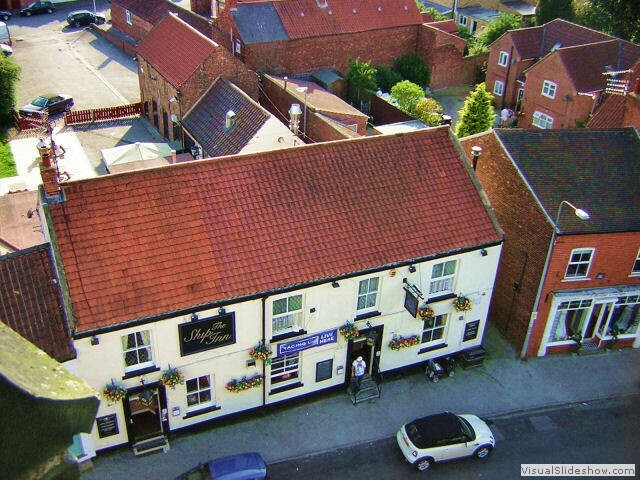 The signboard above 'The Ship' can just be made out on the enlargement to announce sales of Marston Ales. I wonder if the van is hiding a view of the seat. 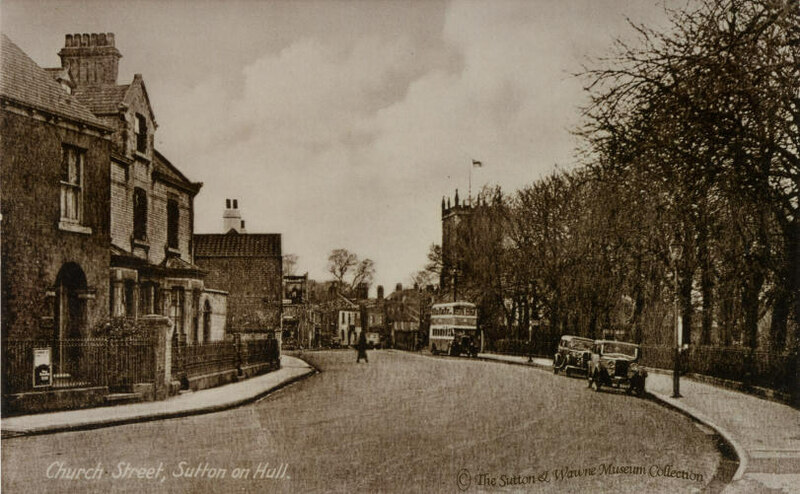 It is a strange anomaly that, despite all that has already been lost, the village is still recognisably the Sutton of pre-war years and with tremendous atmosphere and character. Several people, usually ex-pat Sutton folk living in distant climes, have often asked if anyone remembers two very fond Sutton memories. Over the years, I've had one or two conflicting details, but over all, I think I can now post something that will be meaningful. At least, if not, it will open a lively debate as to the exact details, for I'm sure many of you know. It all concerns two much-beloved Fish & Chip shops of the 1950s-60s. It seems that the said shop near the corner of Lowgate and Church Street, right opposite the seat and phone box, was an establishment colloquially called "Fanny Brown's", but whether that was the official name is another matter. I'm told it was previously owned by a 'Sykes'. It was next door to the Duke, a little way along from the corner. The other one was at Tweendykes shops, and I understand the first shop in the row from Tweendykes end. This was owned by a family called 'Everingham', but again had a colloquial name, "Mucky Mary's". No doubt a cruel epitaph bestowed by children, for I'm sure I don't know what they mean! (says he with a wry smile). Of course, if anyone has photos of these renowned establishments, we'd be very grateful and could post them here. No doubt, a young'un could get "four penn'orth of chips, and can you put in some scratchings please." Ah, what is life if you can't have some scratchings, and a bit o' crackling now and again. DO YOU REMEMBER THIS CHURCH ? 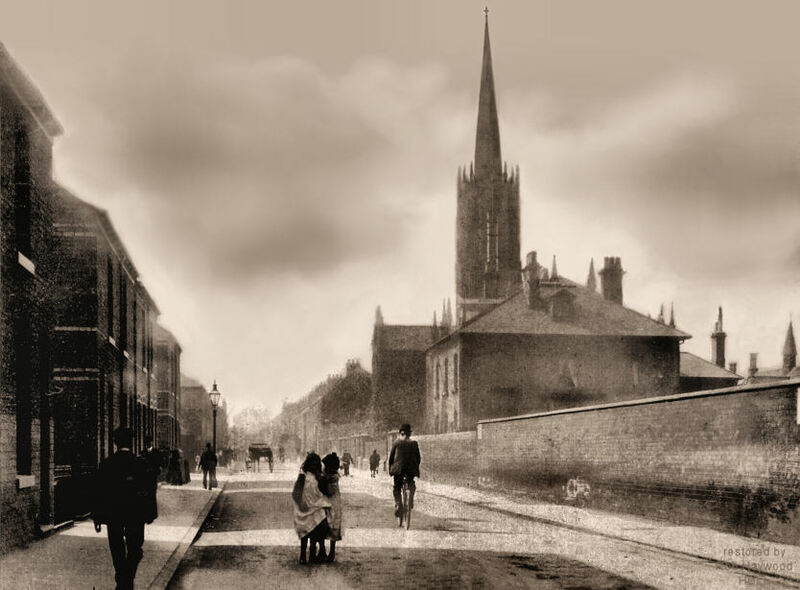 Amongst the annals of old Hull history, this is a well-known image, poor though it is. 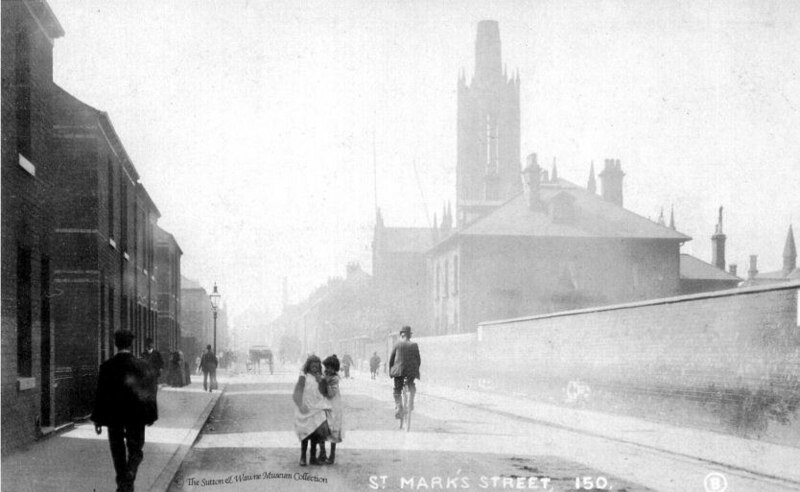 We're looking west, along St Mark's Street, from somewhere near the old drain and Reckitts factory behind the cameraman. 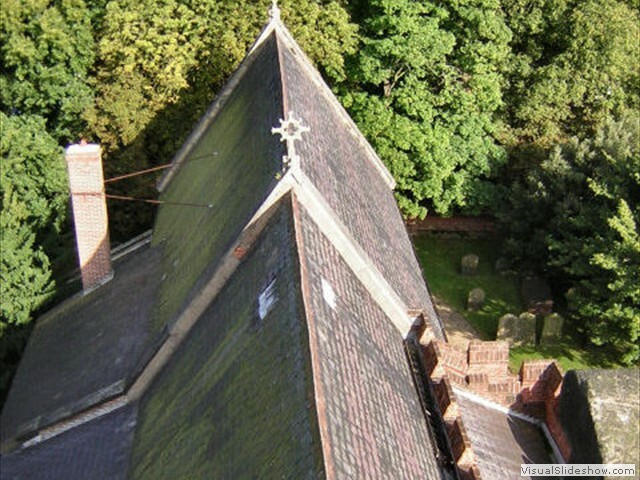 The original image of St Mark's Church was reproduced in one of the famous series of booklets and pamphlets re-published by the pupils and staff of Malet Lambert School in the 1970s-80s. These were then scanned more recently by various people and published digitally. 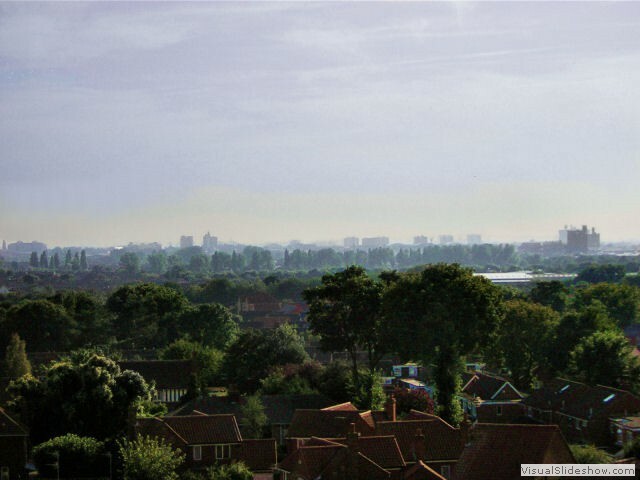 Pass your mouse over the left-hand image to see the original, and then over the right-hand image to see my restoration to something reasonably viewable, including a 'restored' spire. I realise the spire was clipped because it was never completed. Here we can imagine how it may have appeared. It was a beautiful church, of that there is no doubt, an octagonal lantern tower topped with gothic-style pinnacles and a glorious spire. I would imagine that the inside was just as glorious. 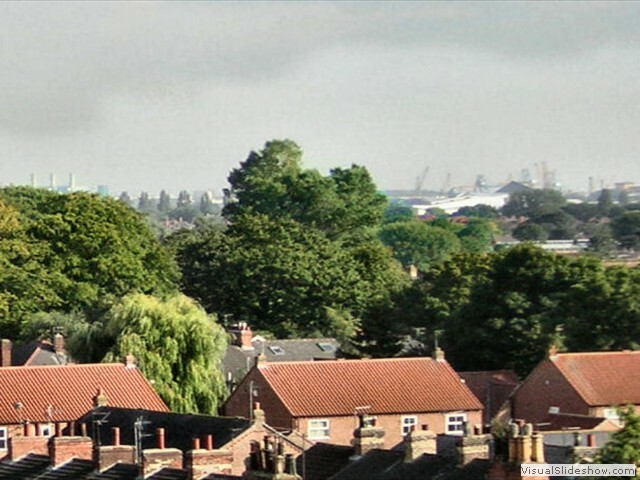 The church was so extensively damaged during the Blitz that it had to be completely demolished, no doubt suffering for its very close proximity to the gas works literally next door, Reckitt's factories very close by, and right in the centre of major Hull industries generally. 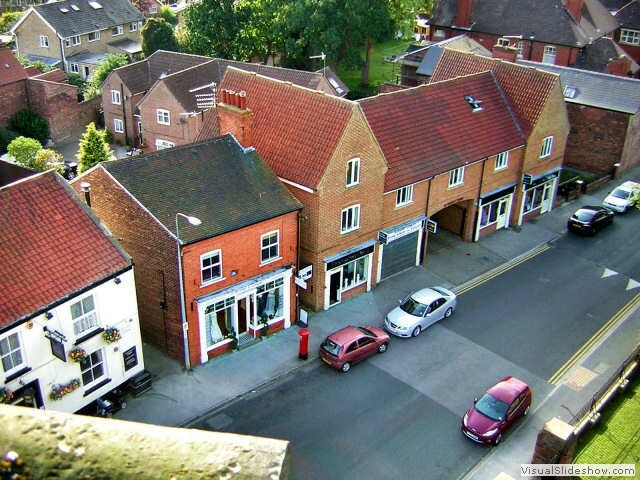 Back in the 1880's, at the time of that census, St Marks in The Groves was part of Sutton parish, which stretched right down Cleveland St, along the north side of Witham, and back up Dansom Lane. 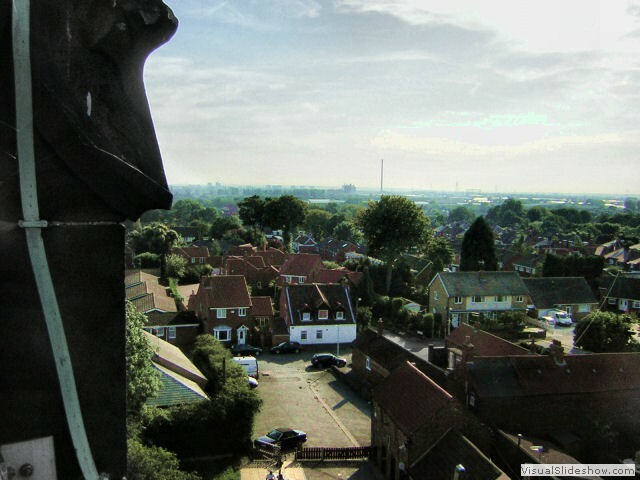 Not so long after that census, the original parish was split to take account of the massive increase in population in East Hull generally, and St Mark's was one of several new churches built to accommodate the new housing in the area. Other new churches around that time included St Columba's on Laburnum Ave - Holderness Rd corner, a newer St Mark's on Bellfield Avenue in the 1950s, followed by St Andrew's on Sutton Park in the 1970s. we can display a successful slide show with minimum coding. old pupil of St James' CofE School in Sutton. on a separate page, or in a more prominent position. It's still just testing to see if most viewers can see it on most browsers. A short description should appear with each slide and the control fade out. 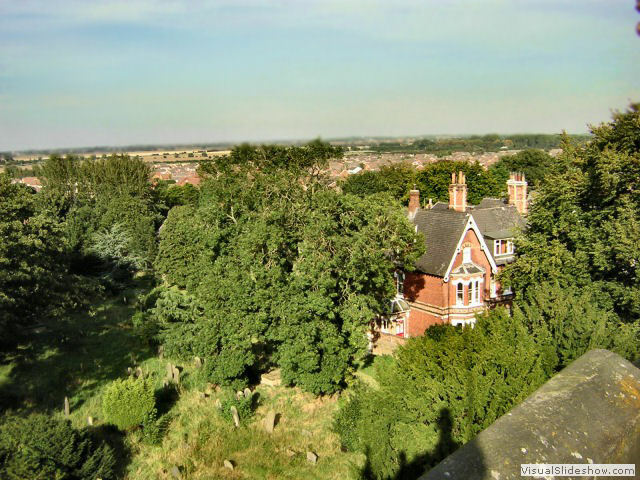 A SELECTION OF ALAN'S SCENES : "THE VIEW FROM THE TOP"
A recent email from Andrew Suddaby, a Sutton ex-pat now living in Cumbria, explains his understanding of the origins of our 'Humber Stones', situated at the gates to the War Memorial. Additionally, a personal biography of his family was deposted some years ago with our museum, and can be seen in our collection on Fridays. He also asks if anyone knows the whereabouts of an old Sutton Scouts trophy. Andrew writes: "I didn't know that the large flat stone was called the 'Humber Stone' but I have a very distinct memory that, when I was a young boy in the late 1940s or very early 1950s, an old villager, but I forget who it was, told me that the larger flat stone in front of the war memorial had originally been sited on the low lying ground roughly where the old coal staves were (now by the cycle path as it leads into the childrens' playground area). He added that it had stood at the edge of the 'lake' and had acted as a 'landing stone' way back in the days (possibly medieval but probably much earlier) when that area to the North of the village was under water and was a fishing ground for the villagers. I suspect that it was brought up to its present position when the war memorial was erected." 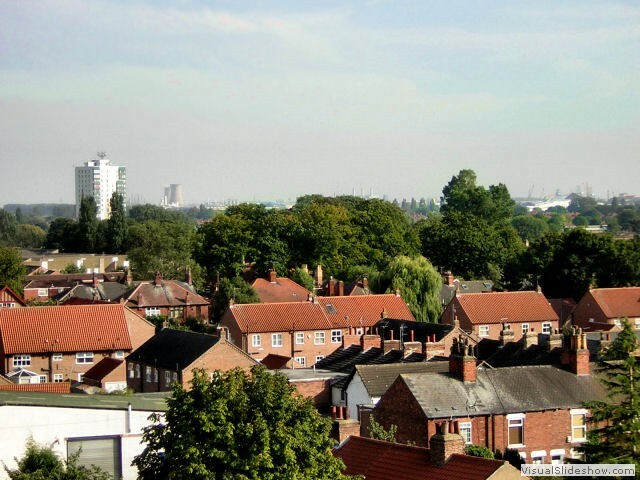 "I lived down Highfield and, as children, we often played in the field that is now covered by Highfield Close. Locally, the field was called Beckett's field because Mr Beckett, the coal man, grazed his horse there. 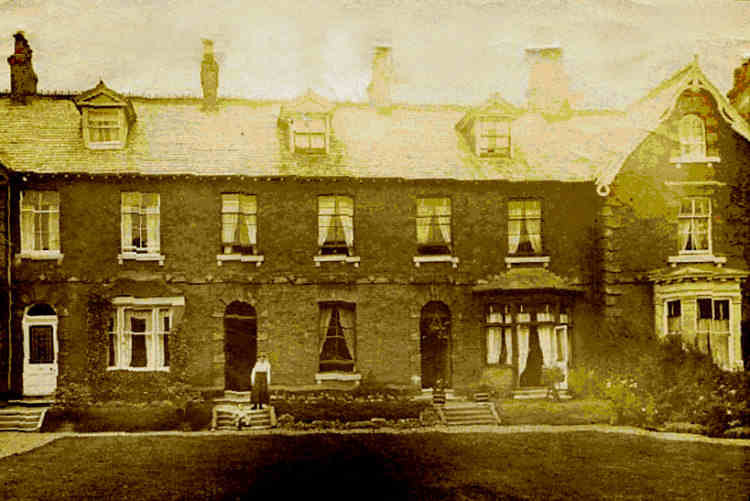 It was actually owned by the Sewell family who had built the houses down Highfield and originally intended to develop this field. The entrance off Highfield had been started in pre-war days but development of Highfield Close was delayed by the war and didn't get under way until some time in, I believe, the 1960s. Very pronounced Medieval ridges and furrows stretched all the way down the slope of the field from up near the big house, which during and after the war was used, I recall, as an auxiliary fire headquarters. That field must have been one of the last surviving bits of the old Medieval field system. A tree that we loved to climb still stands in the front garden of one of the houses but the lower branches are now too high off the ground for small children - or even adults - to reach! Incidentally, does anyone know the whereabouts of the 1st Sutton-on-Hull Scout Troop trophy? This was the tip of the wooden propeller from Amy Johnson's plane. I don't think that it bore an inscription to that effect but it was made of mahogany and stood about ten inches high on a wooden plinth. I suspect that it was dumped years ago but, if anyone knows where it is, it would be an interesting addition to your collection." 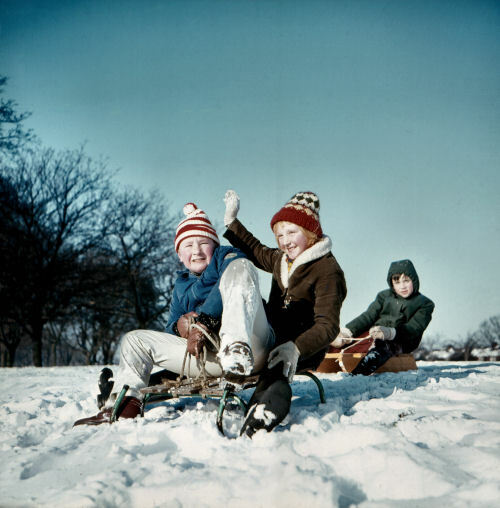 Andrew mentions another memory that may well gell with some readers: Who remembers the Scout meetings in the Church hall that always ended up with games of British Bulldog (a wonder we didn't maim each other) or shuffle bottom kick ball. That floor got a regular Tuesday night polishing off our corduroy shorts and they in turn got a very shiny coating on them! God knows what our mothers made of it all! Andrew was born at 23 Highfield in 1938, and evacuated after the land mine dropped lower down Highfield causing massive damage to all the houses down there including number 23. 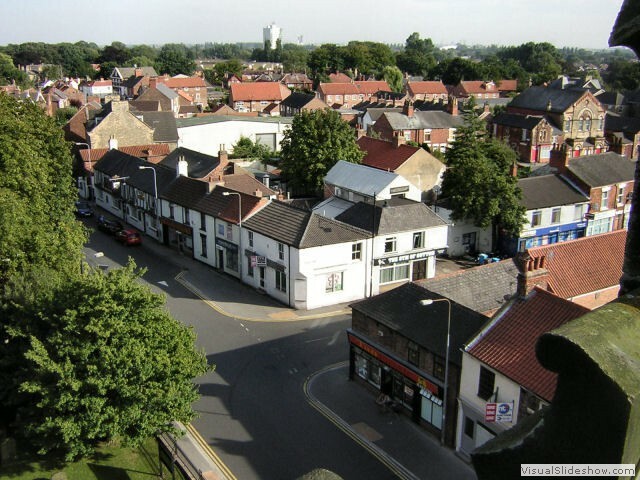 They spent the remainder of the war in the village of Rawcliffe near Goole and returned in December 1945 after his father was demobilised from the R.A.F. Past visitors to the museum were Ray and Pat Kirby, now living over in Derbyshire. 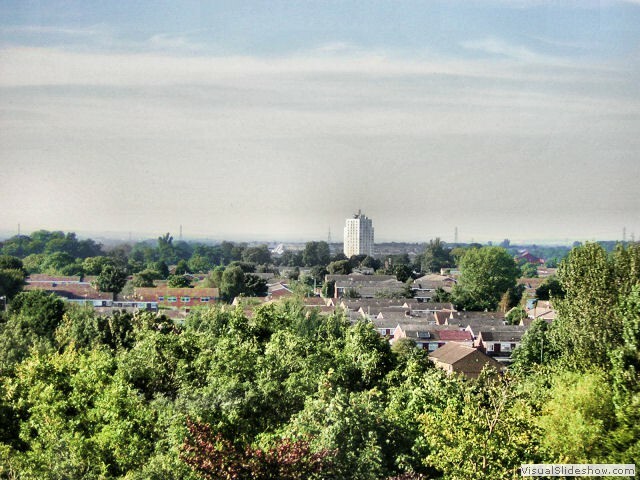 Older residents will	perhaps recall Ray	as the son of Doris Kirby, and who left Sutton to persue a teaching career in various parts of the country, including the London and Manchester areas. Ray later became a school head, after many years teaching history. They both enjoyed their visit, browsing the many albums and recognising the many old faces of relatives, school friends and neighbours. An accolade indeed from a history teacher, we think we got a definite 'thumbs up' from them both, and we look forward to seeing them again when they're next over this way. Other visitors were a family from Surrey. Howard, Vanessa, Jack, Lara, and Charlie Paterson Hughes, came to visit our brave pilot's grave in the churchyard. It's lovely to know that other folk care, and remember. That is some gorgeous bunch of flowers, for a man who lost his life on behalf of our country and freedom 73 years ago this coming September. I hope the family don't mind us calling Pat 'our pilot'. 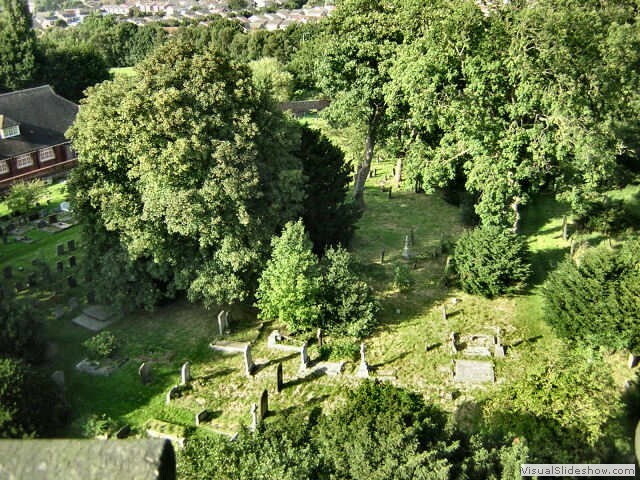 Of all the wargraves in our churchyard, Pat came from the furthest away, he was so far from home. I suppose we have sort of adopted this quiet mannered Australian who would never live to see the part he played in our freedoms today. If this family would like to contact me, a better copy of this photo awaits them, plus a short piece of small video of the grave and the church in the background. I'm sorry we missed them; a day later, and they would have found the museum on its normal Friday opening. We would love to have met them. I do wonder if they have seen Pat's page on this website, and the story of how it came about; perhaps that's how they found us here in the first place. Click Pat's name in the underlined link above. MORE BLASTS FROM THE	PAST We've had a wonderful offer from Margaret Rowling (nee Bruce), seen below, who grew up in Sutton in the 1950's-60's. Margaret, a retired teacher, now lives in Filey, and she has offered to our collection her own slides of Sutton from those years. 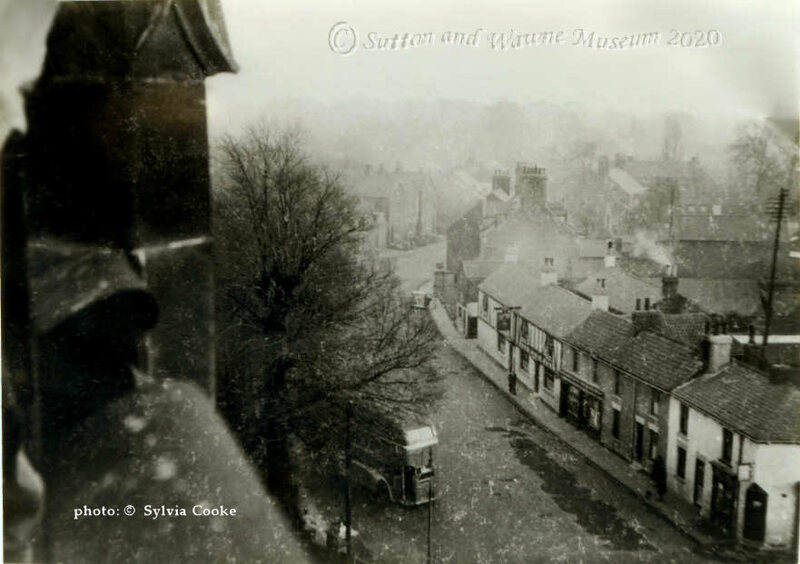 She first wrote a couple of years ago to send us the photo of Church St in the snow shown on the Home Page, and now she has written to offer us the slides, and also to give us the link to her collection of photos she has posted on her Picasa Web Album online. Click HERE . . and then select the set you'd like to view. 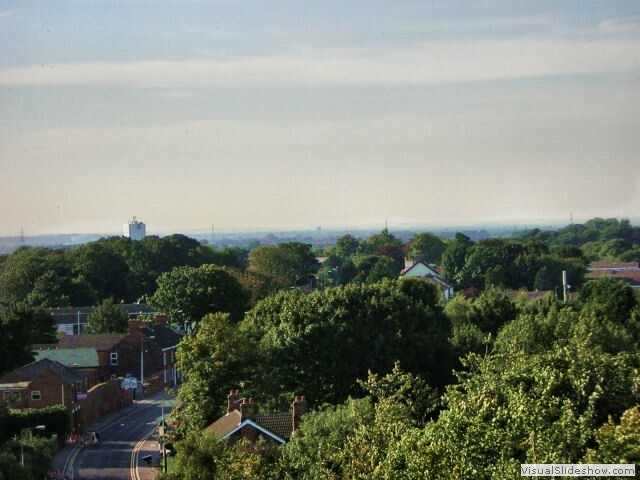 Quite a few old Sutton memories on here, of Garden Parties and other events. 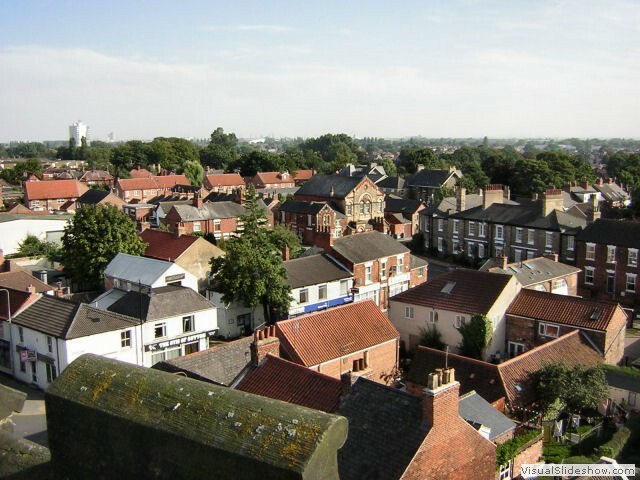 There's some others too, on Filey, and history, and gardening. Enjoy ! In the meantime, we have a pre-1930 view of Church Mount, with two members of the Calcutt family at no.10. Margaret's grandparents lived next door, to the right at no.11. The two ladies in the separate picture are the Misses Calcutt, Isobel and Vera, who at one time emigrated to New Zealand and then later returned to Sutton. 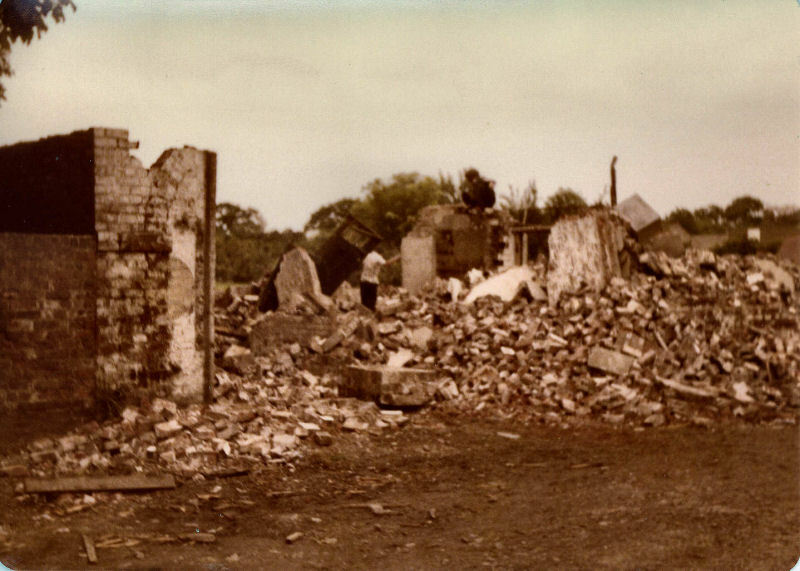 Margaret also recounts some of her memories of the Blitz .. read her blog HERE . How deep childhood impressions go ! My recent memory is a very fallible sign, I think, not only of old age, but of the increasing complexities of life; but my early recollections are still startlingly vivid. So it is with my opposite number in Adelaide, South Australia, Mrs B L McGough, formerly Beryl Rowntree and now professionally known as "Barbara Page", the 'Miss Humber', it would seem, of their evening newspaper, 'The News'. 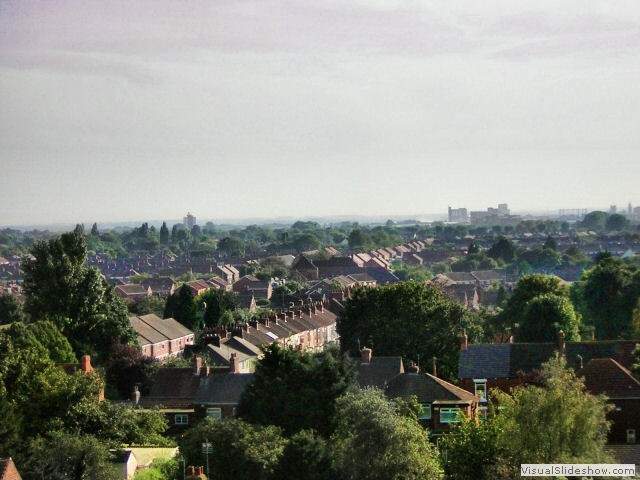 Mrs McGough, who is also doing a lot of freelance work for mainstream magazines and radio, was born in Sutton, and she was extremely interested in one of our aerial photographs of that area which someone sent me during the summer. "Seeing the photograph has brought back a flood of memories," she writes. 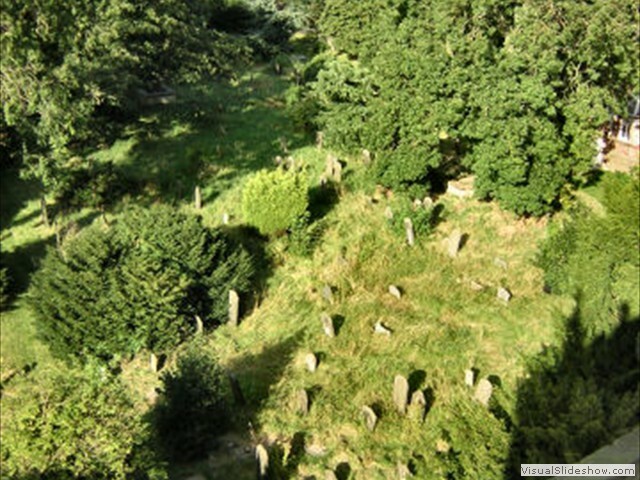 "The place hasn't altered greatly in its layout; I can recognise every stick and stone. "I can see the house where I was born, 2, Rutland Terrace, with my grandparents' house next door. 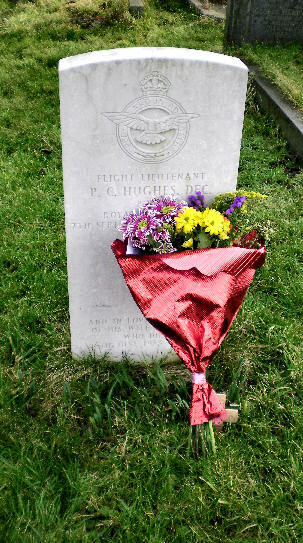 Mr and Mrs W Goodin, they're buried in the churchyard there, with the names of my two brothers inscribed on their gravestone, Cadet Kenneth W Rowntree, aged 16, lost at sea, and Pilot-Officer H Raymond Rowntree, aged 21, lost on operations, both in 1941. Mrs McGough remembers the names of many people who lived in her street. ; The Pinkneys, The Danbys, the Hakeneys, the Simpsons, the Pitchers, the Grays, the Hodgsons. "Church Street was the hub of our universe. 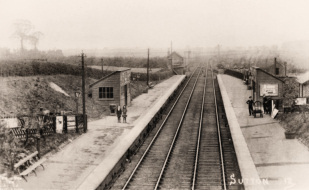 I remember the Carricks at the corner of Stoneferry Lane, the station where I watched troops going off in World War I, the church school, the church where we played many hours happily among the graves, the Methodist Chapel where I went three times every Sunday. "I ran my mother's messages there, shopping at Wheelhouse's, spending my Saturday pennies at Rene Rodmell's sweetshop, buying a reel of cotton at Miss Heron's, the drapers (and I can still hear the tinkle of the bell on the shop door as you opened it). "We gazed at the mugs and jugs and bowls in Miss Moody's and stopped to look at the pots and pans in Fletcher's. "Every day I walked the long stretch to the Council School up on the hill four times a day. I can even remember my first teacher there, Miss Richardson, beating time to 'All Things right And Beautiful', apparently her favourite hymn. "I can still pinpoint Holmes the butchers, and Hickeys further along. Sutton House has come out fine; I remember picnics and garden parties there and the annual Horse Show. "Winnie Leake lived in a house on the estate, and learnt music with my teacher, Bertha. 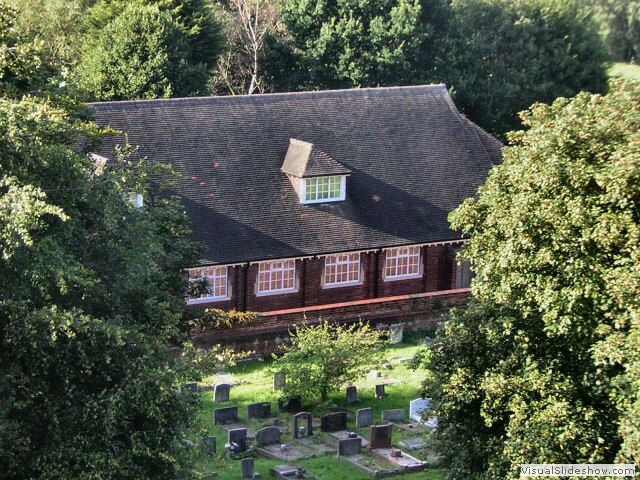 The Sewells lived just there, opposite Potterill Lane, and their nieces, Marjorie and Mary Cross - I went to their double wedding in the Methodist Chapel in 1938 or 1939, and watched them given away by their aunts, Lydia and Hetty." Mrs McGough adds that one of her schoolteachers, Clarice Annison, is still living in Church Mount. 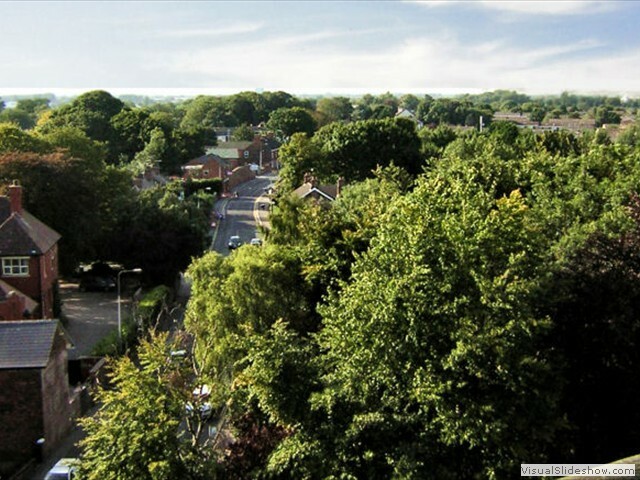 An uncle, Mr Harry Goodin, is still living in Sutton, and until recently another uncle lived in Lime Tree Avenue. 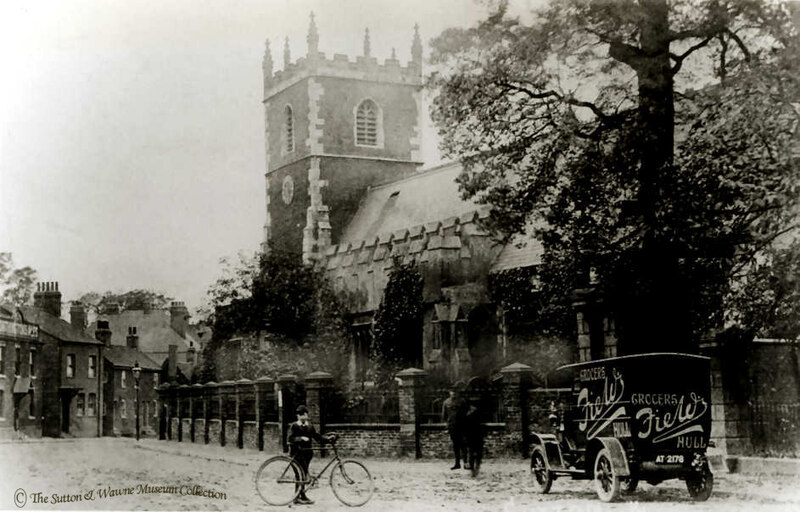 She draws a vivid picture of life in pre-war Sutton, when the church bells rang … and later, one would meet the bellringers, a solid and portly group, in best suits and boots, watch chains and waistcoats. "Having rung the bells, they never felt obliged to attend the formal services and took their regular Sunday morning stroll always in the same direction. I know this well, because my Uncle Tom was one of the bellringers. "We had the 'gentry' then … the Smiths, the Robsons, the Waterhouses, the Bladons, and the differences were sharply defined. But somehow we never felt deprived or inferior. We all knew our places. "The doctor had a special place too, and everybody in the village knew Dr Gillespie and looked up to him in a way. And then he took on a raw, young partner, Dr Bruce. I well remember the curiosity about the new, pink-cheeked Scot, who, my grandmother said, was 'too young' and she much preferred old Dr Shaw who visited the village every so often …"
Mrs McGough later went to Australia to live with her daughter, hence her semi-retirement doing freelancing work on the Adelaide newspaper. That was several years ago, and she would be well into her 80's now if she's still alive. I'm sure her memories are shared by many other folks too, and do illustrate what a close-knit community Sutton was in those days. from 10 am to 2 pm . . .
soft drinks, tea, coffee, biscuits can be served ..
Not bad for a drink, a biccy, and a natter! What about the folks in this modern photo ...? 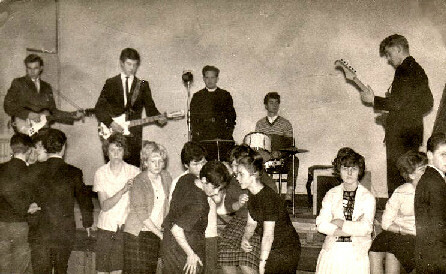 "The photo of the rock group - This was the Aztecs, playing at the Sunday evening youth group in the church hall, in 1962 I believe. The lead guitarist , second from the left, was Douglas (Bugs) Scarfe (who now lives in Italy). The drummer was not from Sutton. I believe his name was Charlie and he went on to be a professional drummer. At the back is the Vicar, Rev. Richardson. At the right, playing rhythm guitar is Brian Holland. He lived on Tweendykes Road, unfortunately has now died. The singer was the son of the church organist and he was Grahamme Bateman. I recognize the Blain twins dancing." Thank you, Elaine. Terry King, also sent this old photo a year or so ago dating from the early part of the last century. 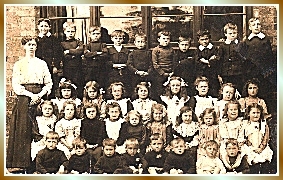 Taken about 1914 or just before the First World War, Terry's mother, born 1906 and aged about 6 here, is on the second row from the front, second in from the left. Another sister is at the other end of the row. Their maiden name was Catterick. Old images such as this are so full of atmosphere. Look at those lads standing proudly with their arms manfully folded. Many would have fathers soon to be lost in the First War, and whom themselves in turn would go on to have, and lose, sons that would know the terrors of fighting in the Second. 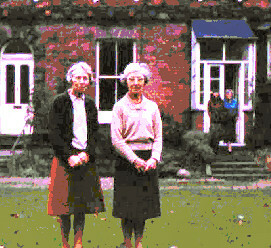 And the girls, of course, as wives and mothers, by and large kept house and home together while they were away . . as did Terry's mum shown here. She later knew the trauma of the Blitz, and of having her son evacuated to the Lake District and not knowing how it would all end. Can anyone recall the name of the school mistress ? There is more information on the Hull Blitz here ..
... in reality, 16 scans, A4 size, of a larger streetmap of Hull, dated 1945. It tells it's own story, and is some testament to the some 1,300 Hull residents killed, listed above in the Civilian Index, and the 12,000 injured, during those dark days. Opens in a new Window. 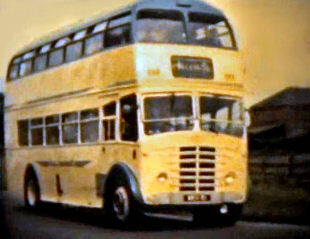 A familiar site in Sutton in the 1950's, before Bransholme was started, when the 32 service terminated in Church Street. Behind this AEC Regent III, note the Corporation Telephones phonebox which used to be just at the end of the church wall, right opposite College Street. 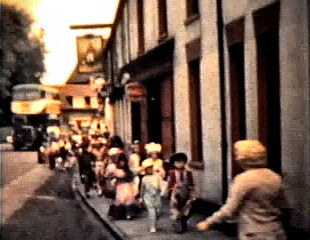 Behind the cameraman would have been Brown's Fish & Chip shop, formerly owned by the Sykes family, and the Duke of York pub. The Duke is still there, but the chip shop is now a foreign 'takeaway'. Such curious terminoloy they use now, our fish & chip shops were all 'takeaways' but we didn't seem to have the need to spell it out. We just knew what was what.
. . . AND WAITING TO TAKE THE TRAIN TO THE SEASIDE. 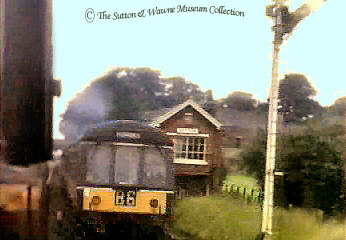 This picture is an improved copy of one formerly supplied by the late Terry King of Sutton. We know now that it is copyrighted to the Lens of Sutton Association and the Ken Hoole Study Centre Collection at the Darlington Railway Centre and Museum. It was supplied to us by the good offices of Ken Mell, former Sutton resident and St James' school pupil, and enthusiastic railway photograper. A slightly foggy but very atmospheric day on the Hornsea line, as two young girls appear to be awaiting the train to the seaside, though more probably to school somewhere. Note the signal box, where the playground is now, and the points for the coal siding. You can click this picture for a greatly improved image. I love the story of the family that lived just about opposite the railway station, in the days before the trees grew so large. 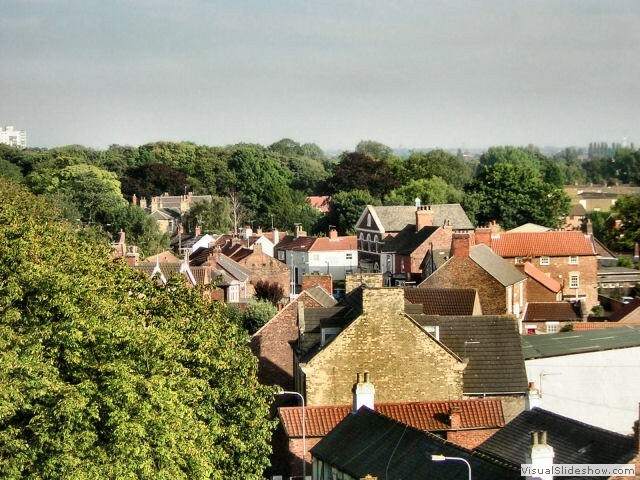 When getting ready for work in a morning, the gent of the family could look right out over to Swine, and see the smoke of his morning train into Hull as it left Swine station. He then had plenty of time to finish his coffee, don his hat and coat, and walk the few hundred feet down the ramp to the station. Except, on the very first morning of diesel operation; there was no smoke . . . so naturally, he missed it. I'm told his name was Mr Cross. And I bet he was too! New technology ..? Bah !! The photo on the left is from a glass plate in the Rev Coleman Collection. 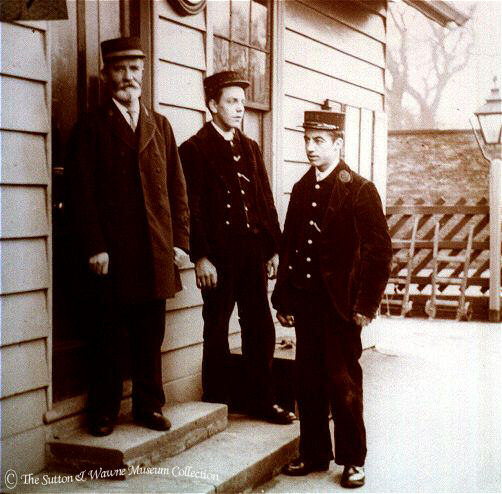 Mr Rodmell, the Station Master, seen here sporting a fine Edwardian beard, with two of his staff, an unknown lad, centre, and Mr White. Some more likely Hull lads here, though some may be from Sutton. 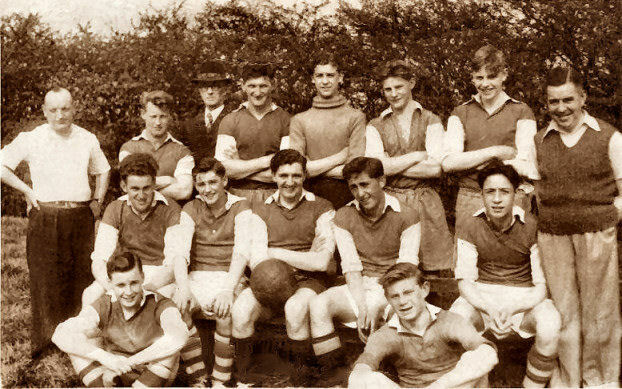 I wonder if anyone recognises any of these fine young reprobates . . Click the picture for a closer look. Are they Hull Sea Scouts, Sea Rangers . . ? Previous offences will be taken into consideration !! I suspect someone will see their dad or grandad in here. 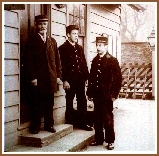 Use this page also in conjunction with the Family History information and links page for more information as to what is in the Centre, and other links on the World Wide Web.